Comment on "I am Neil deGrasse Tyson – AMA" (November 13, 2011). The trouble is with socialism, which resembles a form of mental illness more than it does a philosophy. Socialists get bees in their bonnets. And because they chronically lack any critical faculty to examine and evaluate their ideas, and because they are pathologically unwilling to consider the opinions of others, and most of all, because socialism is a mindset that regards the individual – and his rights – as insignificant, compared to whatever the socialist believes the group needs, terrible, terrible things happen when socialists acquire power. philosophy gets on my nerves. If we analyze the ultimate ground of everything, then everything finally falls into nothingness. But I have decided to resume my lectures again and look the Hydra of doubt straight into the eye, and it be quite ominous if one values one's life. What I've come to learn is that the world is never saved in grand messianic gestures, but in the simple accumulation of gentle, soft, almost invisible acts of compassion, everyday acts of compassion. In South Africa they have a phrase called ubuntu. Ubuntu comes out of a philosophy that says, the only way for me to be human is for you to reflect my humanity back at me. Socialism is, among other things, the political habitat of low self-esteem, incompetence, self-loathing, and a willingness to steal – or have stolen for you what you are unable or unwilling to work for. Socialism is a philosophy fit only for slugs, leaches, and mosquitoes. My philosophy of life is that the meek shall inherit nothing but debasement, frustration and ignoble deaths; that there is security in personal strength; that you can fight City Hall and win; that any action is better than no action, even if it's the wrong action; that you never reach glory or self-fulfillment unless you're willing to risk everything, dare anything, put yourself dead on the line every time; and that once one becomes strong or rich or potent or powerful it is the responsibility of the strong to help the weak become strong. I thought I might teach philosophy but the atmosphere of a college faculty repelled me; the few islands of greatness seemed to be washed by seas of pettiness and mediocrity. The bosom-weight, your stubborn gift, That no philosophy can lift. A wise man once said, "never discuss philosophy or politics in a disco environment." philosophy is empty if it isn't based on science. 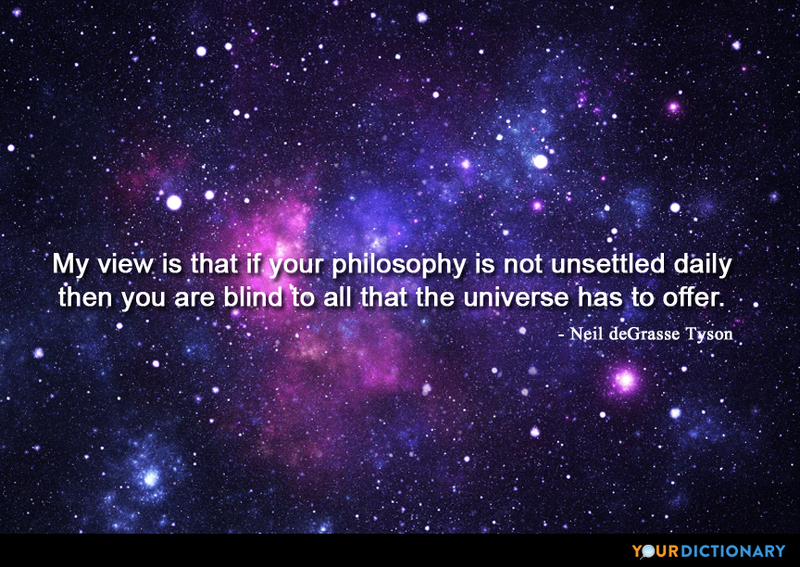 Science discovers, philosophy interprets. Ancient philosophy proposed to mankind an art of living. By contrast, modern philosophy appears above all as the construction of a technical jargon reserved for specialists. Axioms in philosophy are not axioms until they are proved upon our pulses: we read fine things but never feel them to the full until we have gone the same steps as the author.  Letter to John Hamilton Reynolds (May 3, 1818). It is quite true what philosophy says; that life must be understood backwards. But then one forgets the other principle: that it must be lived forwards. Which principle, the more one thinks it through, ends exactly with the thought that temporal life can never properly be understood precisely because I can at no instant find complete rest in which to adopt a position: backwards. Variant: Life can only be understood backwards; but it must be lived forwards. A society which is clamouring for choice, which is filled with many articulate groups, each urging its own brand of salvation, its own variety of economic philosophy, will give each new generation no peace until all have chosen or gone under, unable to bear the conditions of choice. The adjective “political” in “political philosophy” designates not so much the subject matter as a manner of treatment; from this point of view, I say, “political philosophy” means primarily not the philosophic study of politics, but the political, or popular, treatment of philosophy, or the political introduction to philosophy the attempt to lead qualified citizens, or rather their qualified sons, from the political life to the philosophic life. This is my simple religion. There is no need for temples, no need for complicated philosophy. Our own brain, our own heart is our temple; the philosophy is kindness. The last king of Mysore, Jayachamaraja Wodeyar (1919-1974), was, [for example], a renowned scholar in philosophy , a versatile music composer and a writer and humanist . And like many others in the Wodeyar clan before him, a great patron of the arts and culture . If teleological study of the world is philosophy, and if the Law commands such a study, then the Law commands philosophy. If philosophy is still necessary, it is so only in the way it has been from time immemorial: as critique, as resistance to the expanding heteronomy, even if only as thought’s powerless attempt to remain its own master and to convict of untruth, by their own criteria, both a fabricated mythology and a conniving, resigned acquiescence. The philosopher ... subjects experience to his critical judgment, and this contains a value judgment namely, that freedom from toil is preferable to toil, and an intelligent life is preferable to a stupid life. It so happened that philosophy was born with these values. Scientific thought had to break this union of value judgment and analysis, for it became increasingly clear that the philosophic values did not guide the organisation of society. Trivialism is pretty hopeless as a philosophy , although it is very easy to defend /maintain verbally! The main criticism against it which is pertinent to this project is well expounded, and it is an argument from meaning. It is not clear that a trivialist can mean anything by his utterance or written statement, since there is no recognizable judgment attending sentences. philosophy ... finds itself to be no longer anything but the heir to a fabulous mystical theology, but missing a God and wiping the slate clean. Men are constantly attracted and deluded by two opposite charms: the charm of competence which is engendered by mathematics and everything akin to mathematics, and the charm of humble awe, which is engendered by meditation on the human soul and its experiences. philosophy is characterized by the gentle, if firm, refusal to succumb to either charm.  Leo Strauss, What is Political Philosophy?, p. 40. Reported in Hoyt's New Cyclopedia Of Practical Quotations (1922), p. 596-97. [T]hat the Universe was formed by a fortuitous Concourse of Atoms ... I will no more believe, than that the accidental Jumbling of the Letters of the Alphabet, could fall by Chance into a most ingenious and learned Treatise of philosophy.